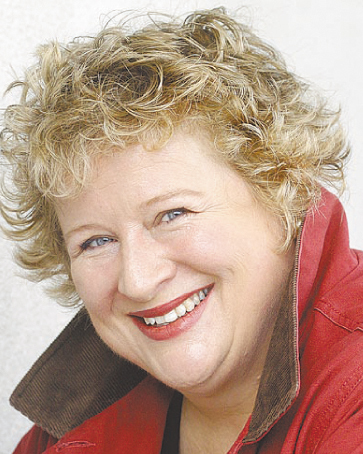 Celebrity-cook Annabelle White is well known for her bubbly and exuberant personaltiy. As an accomplished foodie, she is often seen and heard delivering delicious recipes on New Zeland's radio and television channels. In high demand as a food presenter, Annabel travels extensively to attend food shos and expos. She is also a businesswoman, consultant, author and advertiser. But wait ... there's more. Annabelle is quickly becoming known for her love of Nordic Walking. Annabelle was introduced to Nordic Walking several years ago, whilst on a trip to Austria. Unsure if she would be able to cope, her instructor, Wolfie, simply told her,"If you can walk, you can Nordic Walk!" Like so many people who have tried Nordic Walking, she was quickly hooked. Annabelle now says that "a day without Nordic Walking is like a day without sunshine." With a very hectic schedule and long working hours, Annabelle knows the importance of striving for balance in her life. The fact that she loves Nordic Walking has enabled her to become more consistent with exercise and regularly makes time available, regardless of her other commitments. She says, "I really miss it, if for some reason I absolutely can't get out." "You have to set goals as a way of helping with motivation. It's like a recipe. If you want the outcome, you need to follow the steps," she says. On a recent trip back to Austria, Annabelle took the opportunity to test herself by climbing a mountain near Innsbruck. Now, scenes of Austria are often depicted through the "Sound of Music", as Julie Andrews skips gaily through the buttercup-covered hills. The reality for Annabelle was somewhat different, as even the locals are reluctant to take on this mountain! Reflecting on her achievement, she commented that, "While the mountain climb was certainly challenging, to be honest, using Nordic Walking poles made all the difference." But she observes that one should not confuse this with being easier - "you are simply more efficient as you use more muscles in the climb." What is it about Nordic Walking that Annabelle finds so beneficial? She uses the analogy of driving a car that has been well tuned. "I find that I am using so much more power because my whole body is being used in movement. My posture is more upright and I can take in more of my surroundings when I am walking. I am more stable as the poles give a sense of security and sure-footedness. I definitely feel more powerful!" Annabelle is often approached by well-meaning fans wanting to say hello and chat about recipes and that "comes with the work and to be expected" she says. However, when she is out Nordic Walking, she finds her haven of privacy is maintained. Using her poles allows her to walk purposefully, and with the addition of a pair of sunglasses and a baseball cap, her anonymity is assured. "People are too scared to approach and I don't blame them!" she jests. To get the most out of Nordic Walking exercise, Annabelle recommends that people should seek out a certified instructor who can provide the correct information on techniques and the proper poles to use. "The increased energy, vitality and joy you get out of your daily routine is soooo much enhanced by Nordic walking - for me there was life before Nordic walking and now there is life after and believe me there is a huge difference and what I love is that with a good pair of Asics walking shoes and some Exel travelling poles I can be anywhere in the world and it is so much nicer that working out in a gym - forget lycra and embrace the park and hills!" she says. So what's the next thing Annabelle is about to cook up? She's training to walk the Hollyford Track - and bound to leave Julie Andrews in her wake!